Endometriosis is a painful disorder in which tissue that behaves like the lining of the uterus grows outside the uterus. This tissue is found in various places, like the ovaries, fallopian tubes, and pelvic lining, and can be in or around the bladder and bowel. The symptom includes pelvic pain or cramping usually associated with the menstrual period. Although, there is no treatment for endometriosis, some treatment options, and lifestyle changes can relieve your symptoms so that the problem does not interfere with your normal life. Increase in the blood circulation to your organs. Releases feel-good chemicals are known as endorphins in the brain. Women who exercise regularly are less prone to get endometriosis. Yoga also can stretch and strengthen your muscles, which may be beneficial for pelvic pain management and stress reduction. 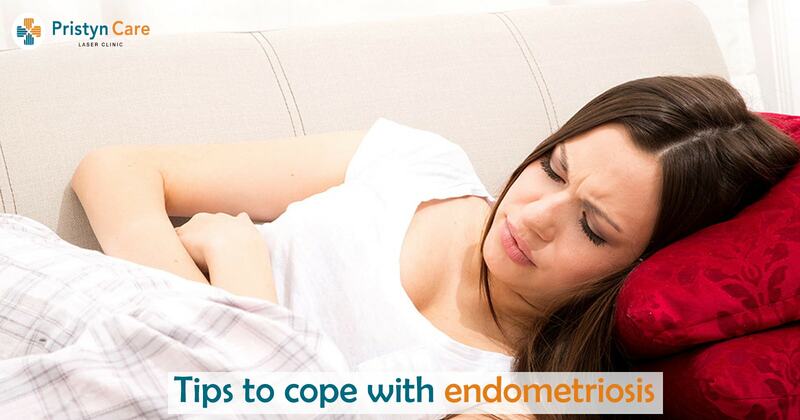 Alternative therapies may help for treating endometriosis. There is a range of different complementary and alternative therapies available like acupuncture, Chinese herbal medicine and vitamins, and dietary supplements. Your doctor may recommend some nonsteroidal anti-inflammatory drugs like ibuprofen or naproxen. Hormone therapy can help to slow down endometrial tissue growth, stop new growth of endometrial tissue, and decrease or eliminate endometriosis-related pain. If none of these work, your doctor may recommend surgery depending on the signs and symptoms, and your choice of becoming pregnant in the future.